WOODBURY, N.Y. - Jan. 8, 2019 - PRLog -- The number of people aged 55 and over on Long Island is growing by 2 percent every year, more than six times the national average for rate of population growth. Many of these Long Island seniors are struggling to live on their own, especially when faced with the challenges winter poses--shoveling snow, walking and driving in icy conditions and getting to and from doctor's appointments. Orchard Estate of Woodbury (https://www.benchmarkseniorliving.com/senior-living/ny/woodbury/orchard-estate-of-woodbury?utm_source=press-release&utm_medium=press-release&utm_campaign=comm-wby-press-release-woodbury-luncheon-dec18), a Benchmark assisted living and memory care community now under construction in Woodbury, N.Y., is answering the call for more senior housing on Long Island and bringing assisted living to the town of Woodbury for the first time. 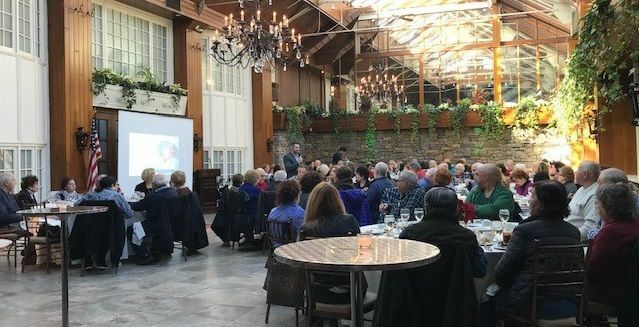 Recently, the community hosted an educational luncheon at Fox Hollow in Woodbury, a sold-out event with over 100 people in attendance and an additional 200 on a waiting list. Woodbury at Orchard Estate Executive Director Doug Cormack, and other community representatives discussed the personalized care and increased independence that Benchmark assisted living provides. They also described the community's commitment to elevating human connection and facilitating the experiences that will keep its residents and families connected to what matters most in their lives. Attendees asked a range of questions, from the type and levels of care that the community will provide to how medication is managed. When complete, Orchard Estate of Woodbury will offer 89 assisted living and memory care units and spacious common areas totaling 74,000 square feet, which can accommodate up to 102 residents. Set on 3.8 prime acres located on 900 Woodbury Road near the intersection of Route 135 and the Long Island Expressway, the environmentally friendly community will feature a modern, contemporary design and amenities such as a 24/7 bistro, wellness center, family room with full kitchen and dining room, second floor balcony and landscaped walking paths. The community is expected to open in either late summer or early fall of 2019 and have an enhanced assisted living license enabling it to provide a wide range of care. Orchard Estate of Woodbury will mark Benchmark's second community on Long Island. The first, Whisper Woods of Smithtown, opened in September. For more information, click here (https://www.benchmarkseniorliving.com/senior-living/ny/wo...). Based in Waltham, Mass., Benchmark is a human connection company and leading provider of senior living services in the Northeast. Founded in 1997 by Tom Grape (https://www.tomsgrapevine.com/toms-posts/2017/8/8/we-made...), Benchmark, with 6,300 associates and 58 communities, offers independent living, assisted living, Alzheimer's care and skilled nursing in Connecticut, Maine, Massachusetts, New Hampshire, New York, Pennsylvania, Rhode Island and Vermont. The organization this year was selected by FORTUNE magazine for its inaugural 2018 Best Workplaces for Aging Services list, taking the number 16 spot on the list of top 40 aging services companies and ranking number three among companies with more than 40 communities. Benchmark is one of only six companies named to The Boston Globe Top Places to Work list every year of the 11 years it has been published. And it has been consistently recognized by Boston Business Journal, Hartford Courant and Hartford Business Journal as a top workplace, and by the Boston Business Journal, Providence Business News and Hartford Business Journal as one of the healthiest employers. Click here for more information (https://www.benchmarkseniorliving.com/?utm_source=press-release&utm_medium=press-release&utm_campaign=bsl-corp-press-release-woodbury-luncheon-dec18).